Buy works – Grachev Vasiliy Yakovlevich | (1831-1905). Sculptor Grachev V.Ya. is considered one of the best masters of small plastics of the XIX century. The main theme of the works is genre scenes depicting people, horses, episodes of historical and military subjects. Grachev's works are characterized by vitality, realistic interpretation of the plot, careful study of details and textured surfaces, as well as masterful transfer of driving dynamics and expressive elaboration of details, especially small ones. 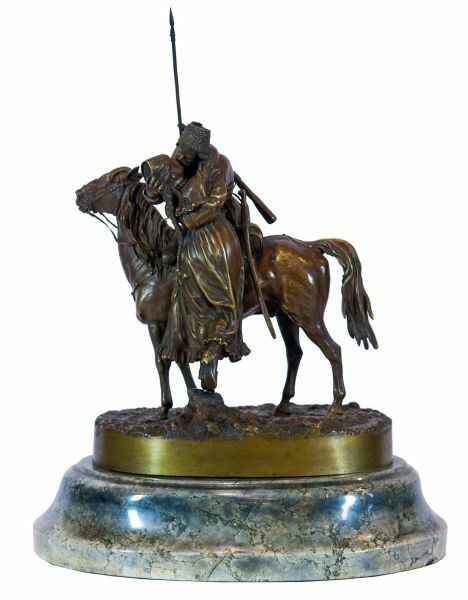 Sculpture group "Hillman leading a horse with Hillwoman". Technique – Bronze, cast, embossing, brown patination. Art Attribution Consultation All-Russian Museum of Decorative Applied and Folk Art. Technique: Bronze, cast, embossing, brown patination. Sculptural composition "Return of a Cossack".